Currently (9/08) closed north of Culver City Park. 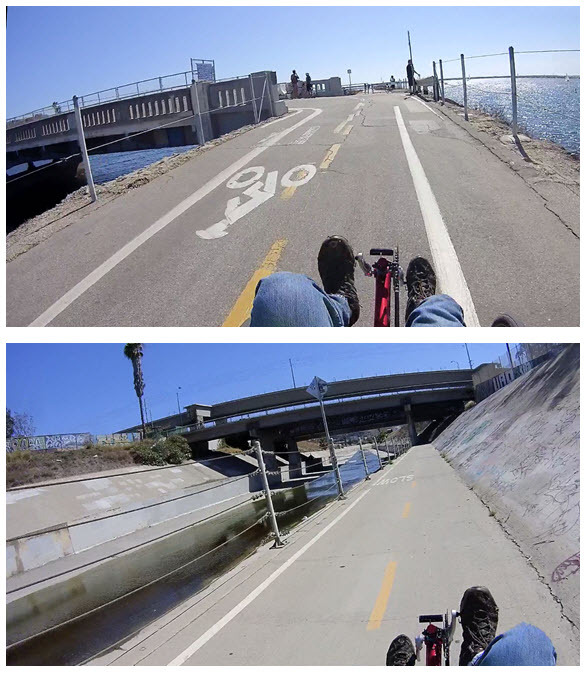 The consensus is that this path might be one of the nicest in town, however, check the comments below, because some cyclists think it goes through some pretty bad neighborhoods, while others don’t. But, if you can feel safe (e.g. with a group), it’s a nice, pretty, breezy ride, about 8 miles from National Blvd. to the ocean, with little parks and interesting sights along the way. Thomas Guide pages 672, 702. Whoever said [this path] takes you by some of the worst neighborhoods in LA obviously hasn’t seen much of LA. It certainly isn’t all that bad. Of couse, you wouldn’t want to ride it at night, but that’s because the path isn’t lit, and there’s no barrier between the path and the canal. . . . Yes, there are a couple of fairly bumpy patches, but they’re few and far between and hardly worth worrying about. You can get a mean wind in your face if you’re ocean-bound, but then you get a really nice push from it on your way back. Nice ride, all in all. North of Inglewood it’s not very well maintained, with numerous rough bumps and decrepit patches. From Inglewood to the sea is a pleasant ride, although the wind will almost definitely be in your face as you head to the ocean. It is generally a nice ride during the day, though I would recommend avoiding it after dark (no lights and bad neighborhoods are potential problems). I occasionally come across “less than upstanding looking citizens” on the way, but there are normally lots of pedestrians, joggers, and other bikers along the way during peak riding hours. . . . 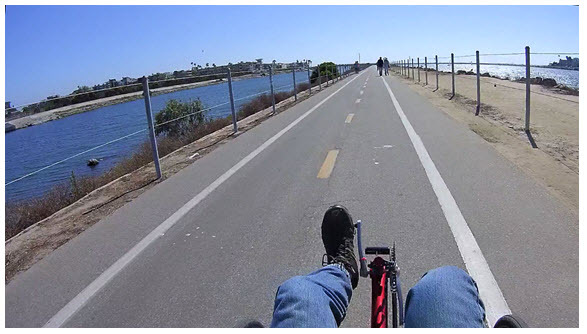 Although you will face a headwind as you ride towards the beach, it’s a great feeling to see the Pacific Ocean come into view, and one can continue on down to PdR and Manhattan Beach if time permits. Lately, there has been some construction going on that requires dismounting, but that is supposed to be over by now. Also, some punks have been breaking glass bottles along the route lately, and it doesn’t appear that the city does much to maintain the path (actually, it often looks like an afterthought, and a neglected one at that). All the same, I enjoy riding this path to the beach! Pic tured here is a sculpture you’ll see as you pass the Culver City municipal buildings. Can you figure out what it is?